Ammonites are an extinct group of animals, there closest living relatives are squids and cuttlefishes. Ammonites existed for 350 Million years, from the Devonian age until the end of the Cretaceous era. Today, more than 11,000 species are known. 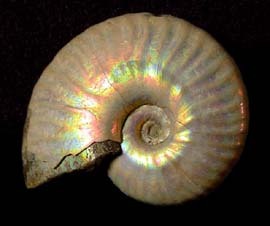 In general Ammonites can be specified within three Orders (Goniatitida, Ceratitida and Ammonitina). Adult specimens normally range between 2 and 20 centimetres in size, but there where also "dwarfs" with less than 1 cm, and "giants" with more than 2 meter. 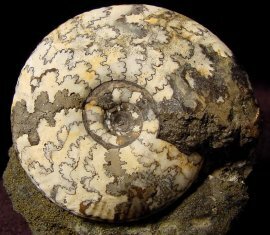 Many of them are excellent index-fossils, meaning it is possible to determine the relative age of sediments because of the Ammonites you find inside. This is why Ammonites are very important for palaeontology. The shell of an ammonite takes the form of a plan spiral. However, there were also heteromorphy Ammonites. Their shell has a non spiral form. The shell can be segmented in the body chamber and the phragmocone. The phragmocone was filled with gas, which gave the animal the possibility to float. Those chambers were walled off by so called septas. Those are visible in smoothened fossil shells. The structure visible there is called Lobes. The soft body of those fossils remain a mystery until today, as unfortunately there is no fossil that shows us the soft body completely. But it is suggested that they looked like a modern Nautilus. Also unknown is the functionality of the Aptuchus and the Anaptychus. It is thought those structures are either part of the jaw, or to close the shell as a lid cover. Nevertheless it is possible to determine the gender of the animal. This sexual dimorphism is depending on the size of the shell. While males have a smaller shell (they are called microconch), females have a much larger shells (called macroconch). Males also have a structure on the opening of the shell that looks like an ear, which is part of the shell.